← Pushcart Prize Nominees 2016! 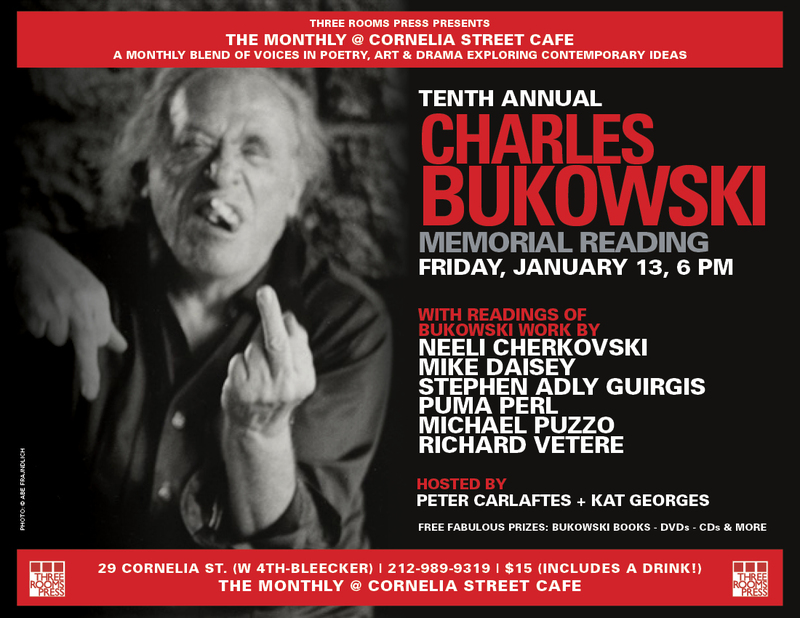 Come and celebrate the turning of the New Year with Three Rooms Press for the Tenth Annual Charles Bukowski Memorial Reading at the Cornelia Street Café on Friday, January 13th, 2017 at 6 pm! The highly anticipated event is hosted by Three Rooms Press’ own Kat Georges and Peter Carlaftes and features a collection of poetry, oral history, rare videos, and readings from various authors. The event will feature performances of Bukowski poems and tales by a unique cast of renowned fans including Bukowski memoirist Neeli Cherkovski (Hank: The Life of Charles Bukowski), Pulitzer Prize winning playwright Stephen Adly Guirgis (Between Riverside and Crazy, award-winning monologist Mike Daisey (The Agony and the Ecstasy of Steve Jobs), playwright/novelist Richard Vetere (Champagne and Cocaine), playwright Michael Puzzo (Spirits of Exit Eleven), and poet Puma Perl (Retrograde). Poet/novelist Charles Bukowski (Post Office, Love is a Dog From Hell) is known as the champion of the outsiders, the lost, the lonely, and the outcasts of society. His work continues to grow in popularity today, with most of his 90+ books still in print. At the event, performers will explore modern approaches to how Bukowski would interpret today’s world. What would Bukowski think of the election results? Facebook, Snapchat, Instagram, Twitter: Would Bukowski be on social media if he was still around? And how would Bukowski feel about the expanding economic inequality? His poetry resonates with answers. Admission is $15 and includes a free drink! Doors open at 5:45pm (for best seating please arrive early). All attendees have a chance to win Bukowski books, CDs, DVDs, and other prizes. Cornelia Street Café is located between West 4th Street and Bleeker Street. For more information you can call 212-989-9813 or visit (http://corneliastreecafe.com/). For additional press details, including photos, interviews and press passes, please call Kat Georges at 212-731-0574. Mike Daisey is an American monologist, author, actor and raconteur best known for his extemporaneous monologues about Nikola Tesla, L. Ron Hubbard, Steve Jobs and Apple’s supply chain in China, the Department of Homeland Security, the history of the New York transit system, 9/11, the inventor of the neutron bomb, Wal-Mart and a variety of other topics. His most recent monologue, THE TRUMP CARD about about the rise of Donald Trump, was staged last summer in sold-out theaters. Stephen Adly Guirgis is an American playwright, screenwriter, director, and actor. He is a member and a former co-artistic director of New York City’s LAByrinth Theater Company. His plays have been produced both Off-Broadwayand on Broadway as well as in the UK. His play Between Riverside and Crazy won the 2015 Pulitzer Prize for Drama. Richard Vetere is an American playwright and screenwriter whose work has received international critical acclaim. His is the author of the play Last Day, and a novel, Baroque, about Caravaggio and the people he painted in Rome. His authored a recent poetry collection, The Other Colors in a Snow Storm. Movies include The Third Miracle (produced by Francis Ford Coppola), How to Go Out on a Date in Queens, and the cult classic, Vigilante. His most recent work includes his highly-praised novel, THE WRITERS AFTERLIFE and CHAMPAGNE AND COCAINE –both Three Rooms Press.